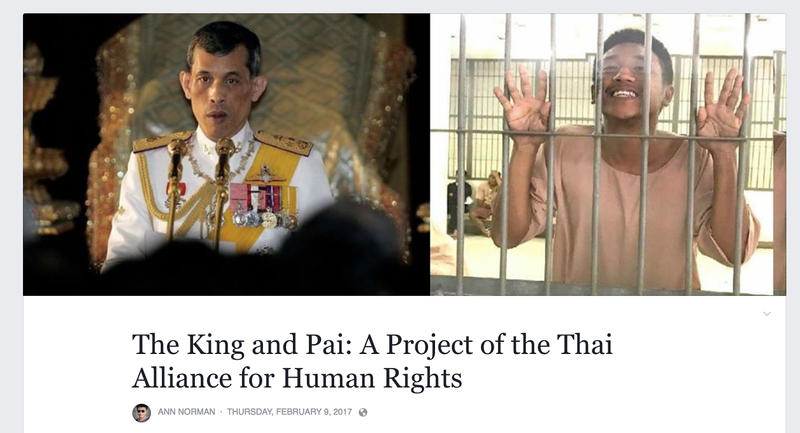 Whereas it has become clear that Pai Daodin's innocence of any wrongdoing is unimportant to the Thai government prosecuting him for lese majesty (insulting royalty) . . . Whereas it has become clear that the condemnation of roughly every human rights organization on the planet, including Amnesty International and the United Nations, is irrelevant to the Thai government in this case, which just yesterday responded officially to the new accusation, from multiple human rights organizations, that its systematic oppression using the lese majesty law may constitute crimes against humanity . . . Whereas Pai Daodin has been locked up to protect the secrets of King Vajiralongkorn . . . Whereas King Vajiralongkorn has not responded to multiple petitions to free the people going to jail to protect his secrets . . . Whereas there is a widespread rumor that it is King Vajiralongkorn HIMSELF who has ordered the persecution of Pai Daodin . . . The strategy of the Thai Alliance for Human Rights going forward will be to talk about the secrets that King Vajiralongkorn is trying to hide AS MUCH as we talk about the young man being sacrificed to protect those secrets. NOTE: I, Ann Norman, Executive Director of the Thai Alliance for Human Rights, am a Farang-American, living in the United States with no plans to go to Thailand. My husband is Tony Norman, a famous American journalist. If anything happens to me, he will let the world know. NOTE: We are also concerned for the safety of Pai Daodin in jail. Many lese majesty suspects die mysteriously in jail. The whole world is watching!!!! We will not believe the government's excuses if even one more lese majesty prisoner dies in jail. And why do we bother to make these Notices? Because one open secret that the King is trying to hide is that he is cruel and murderous and kills anyone who gets in his way. Watch this space for continuous updates about the open secrets of King Vajiralongkorn. We will continue our campaign until Pai Daodin is free.